Modern Music | Guide: Easiest way to restring a guitar? 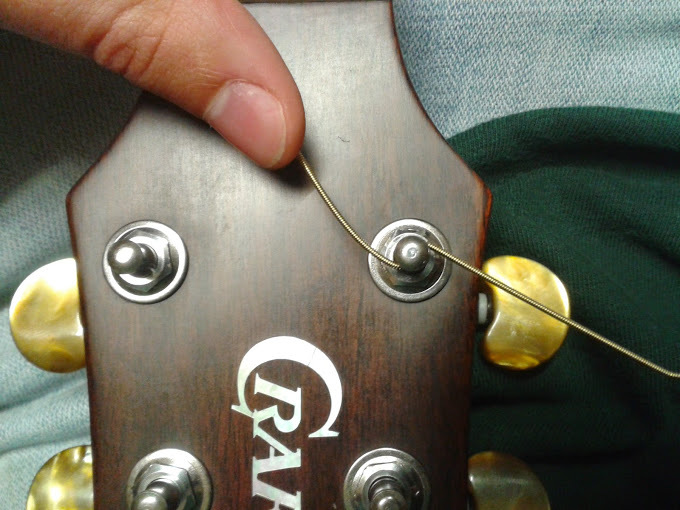 Guide: Easiest way to restring a guitar? Hi Aaron, I always find it hard to restring my guitar. I never know how much string to cut off and it’s always left tangled and leaves my guitar with tuning problems. Can you show me some tips and tricks for the easiest way to restring a guitar? Thank you. Thanks for your question. It’s very important to restring your guitar correctly, as many problems such as rattles and buzzing can occur from strings fitted incorrectly. 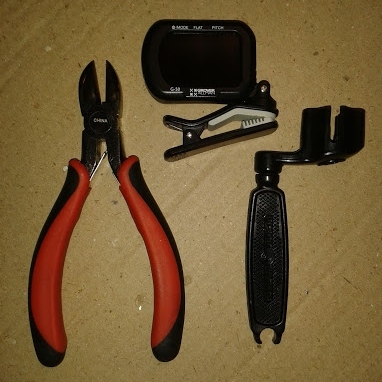 A good set of Wire Cutters, a Peg Winder and a Clip-on Chromatic tuner will help you through these steps. I will list some very detailed steps here, which in my opinion show the easiest way to restring a guitar. There are many different ways people prefer, but in my experience this way is the easiest. It still requires patience and practice, but with time regular string changes should become much easier by following these steps. Step 1: I will first show you how to fit the thicker E, A and D wound strings onto your guitar. The first step is to turn the machine head until the hole is pointing downwards towards the guitar neck. 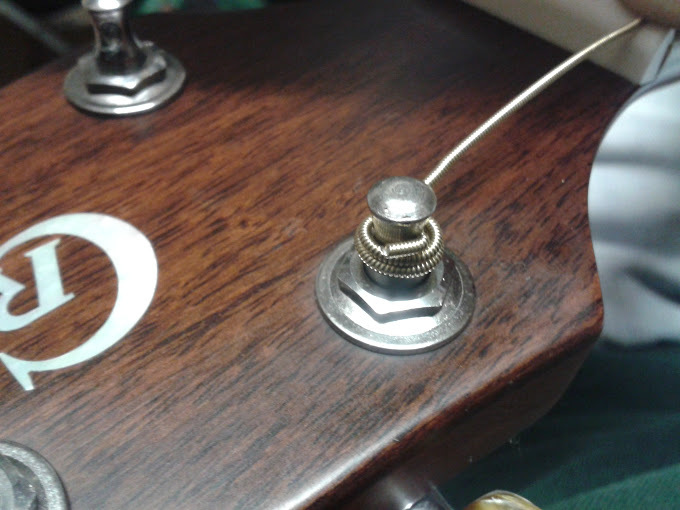 Once the string is secured at the bridge end of the guitar (via Acoustic Bridge Pin, Electric Tremolo or Tailpiece etc) you can then thread the other end of the string downwards through the hole. 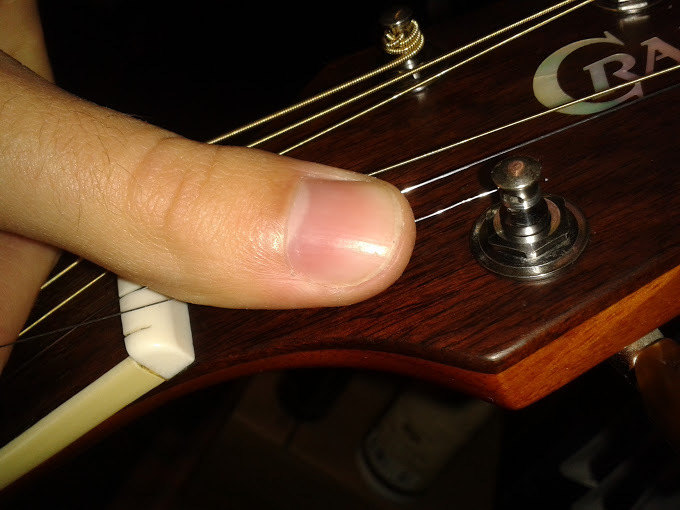 Step 2: The next step is to position your hand on the 12th Fret of the guitar as shown in the picture above. 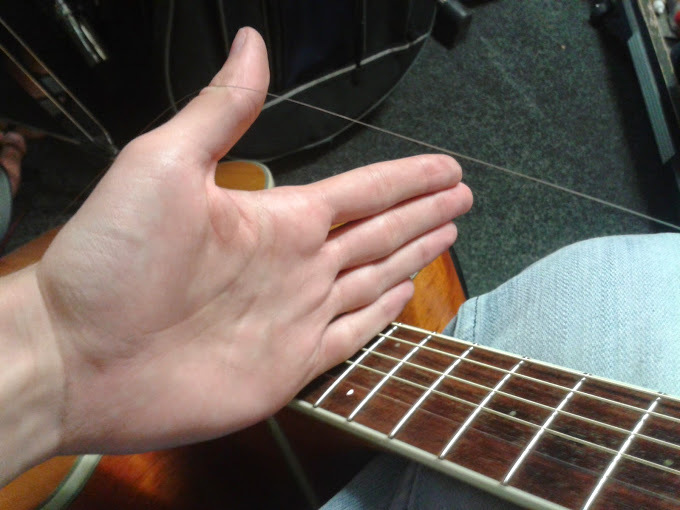 Pull the string through the hole with your hand still in this position, so you have roughly 4 inches of slack string between your hand and the guitar fingerboard. Step 3: Once you have enough slack on the string from the previous step, you can then secure the string in the machine head. First bend the side of the string which is attached to the bottom of the guitar, down towards the fingerboard. Then bend the other end of the string in the opposite direction facing up towards you as shown in the picture above. Step 4: Once the string is secured in the machine head from the previous step, you can now start to guide the string using your thumb or finger, down around the machine head. Hold the string with one hand and turn the machine head slowly with your other hand, be careful as the remaining sharp end of the string will also turn around with the machine head. To speed up this process you can use a peg winder; this will turn the machine head much quicker than doing it by hand. It’s important to ensure that the string is wrapping around the machine head in a downward spiral towards the headstock, you can guide it down with your thumb or finger. If you have followed Step 2, there should be roughly 2 to 3 windings of string on the machine head when tight. 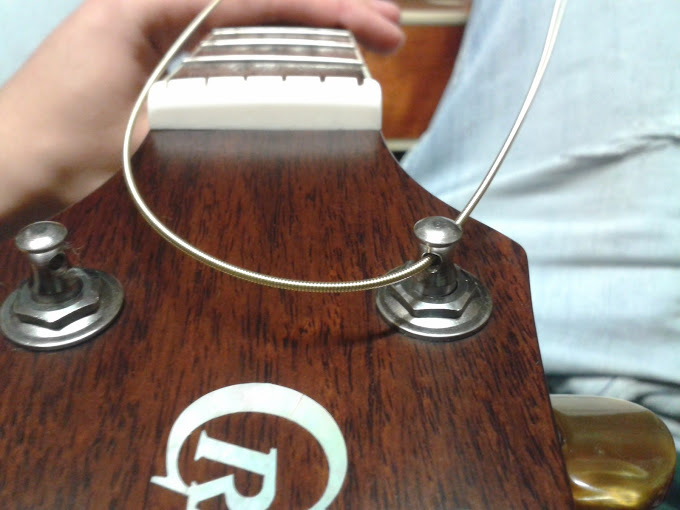 Don’t tune the string up to pitch yet, but tighten it enough so that it sits securely in the guitar nut. 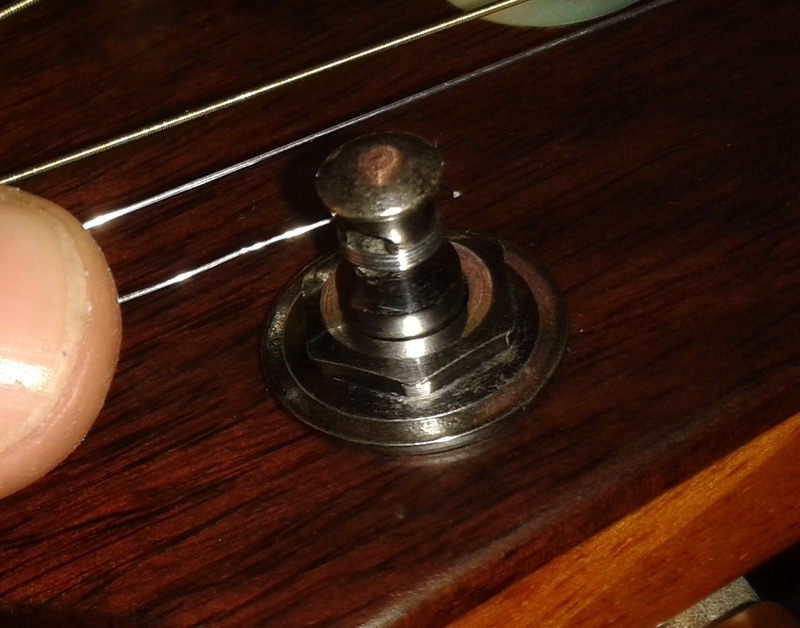 Step 5: Once you have the correct number of windings and the string is tight enough to fit securely in the guitar nut, you can cut the remaining pointed end of the string off. I recommend using wire cutters and to leave about 2mm of string remaining to ensure the string is then secure and will not slip. You can then bend the remaining 2mm of string around the machine head, this will stop it from protruding out and accidentally sticking into fingers. Follow Steps 1 to 5 when fitting the thicker E, A and D wound strings onto your guitar. For the thinner G, B and thin E Strings use Steps 6 to 10 below, it’s the same method as earlier but I’ve included some extra helpful tips. 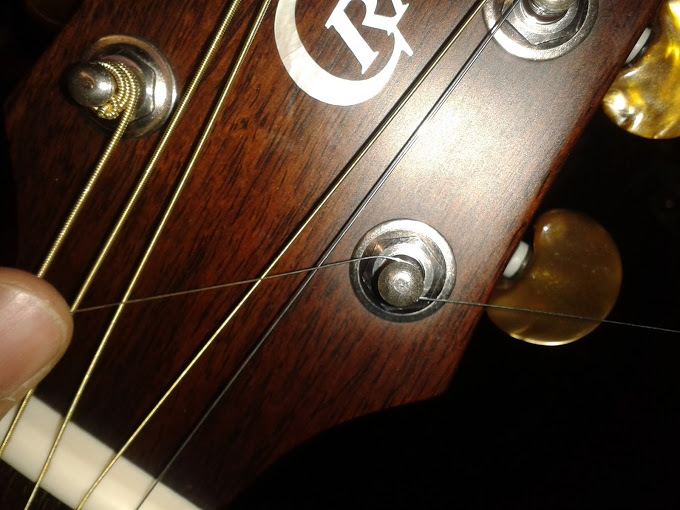 Step 6: When fitting the thinner G, B and thin E strings onto your guitar, follow the previous Step 1. 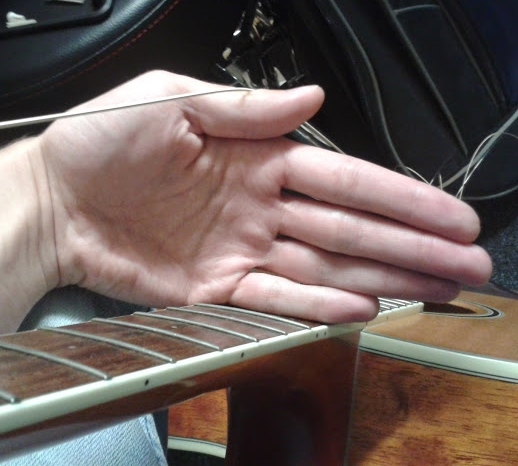 Then follow Step 2 but when positioning your hand on the 12th Fret of the guitar as shown in the picture above, pull the string through the hole with your hand still in this position, you should have roughly 5 to 6 inches of slack string between your hand and the guitar fingerboard. It is better to leave this extra slack for the thinner G, B and thin E strings, as they usually slip more and need to be more secure in the machine head. Step 7: Once you have enough slack on the string from the previous step, you can then secure the string in the machine head. First bend the side of the string which is attached to the bottom of the guitar, down towards the fingerboard. Then bend the other end of the string in the opposite direction facing up towards you as shown in the picture above. Step 8: Once the string is secured in the machine head from the previous step, you can now start to guide the string using your thumb or finger, down around the machine head. Hold the string with one hand and turn the machine head slowly with your other hand, be careful as the remaining sharp end of the string will also turn around with the machine head. To speed up this process you can use a peg winder; this will turn the machine head much quicker than doing it by hand. It’s important to ensure that the string is wrapping around the machine head in a downward spiral towards the headstock, you can guide it down with your thumb or finger. If you have followed Step 6 then there should be roughly 1mm to 2mm of windings of string on the machine head when tight. Don’t tune the string up to pitch yet, but tighten it enough so that it sits securely in the guitar nut. 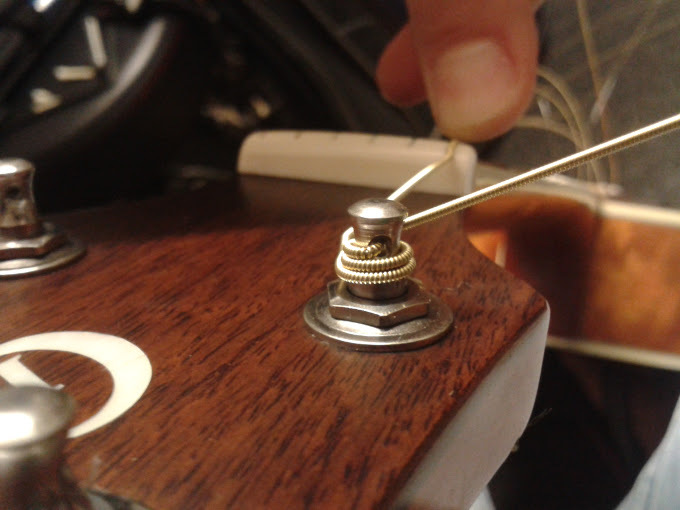 Step 9: Once you have the correct number of windings and the string is tight enough to fit securely in the guitar nut, you can cut the remaining pointed end of the string off. I recommend using wire cutters and to leave about 2mm of string remaining to ensure the string is then secure and will not slip. You can then bend the remaining 2mm of string around the machine head, this will stop it from protruding out and accidentally sticking into fingers. Step 10: Once all of the strings have been fitted, we recommend using a clip on chromatic guitar tuner to tune all of the strings up to their correct pitch. Once all of the strings are in tune, you can carefully stretch each individual string up and down the neck by gently pulling it a few millimetres away from the fingerboard; this will help to keep the strings in tune after a string change. The strings will usually take a couple of days to settle in after a string change, for this reason we recommend changing strings a few days ahead of an important gig. I hope that these steps will help you when changing your guitar strings from now on. Be sure to check out the Tech Tips page regularly for future updates and helpful tips.